To walk around an HR-V won’t give away very much. It’s a subcompact crossover with 4 doors and a lift gate in the back to access the cargo area. It’s got a handsome quirkiness to it and an eager, upright “ready-for-anything” posture. Although it rides higher for better visibility, Honda would rather you think of it more as a car than a crossover. The cargo sill for the rear opening is low and the rear door handles are cleverly hidden in the window frames, giving it more of a sporty, coupe-like look. Inside is comfortable, efficient and all of the HR-V controls are very intuitive and easy to use. Most drivers appreciate the quality of materials and the ample storage throughout. A single 7” touchscreen controls your music and connectivity with ease and works seamlessly with available features like HondaLink and Honda’s Satellite-Linked Navigation System. The HR-V is also available with some of the industries most advanced safety technologies such as Honda LaneWatch blind spot display. When you signal right or hit the end of the signal lever, a live video is sent from a camera under the passenger-side mirror to the 7” display screen which shows you nearly four times what the mirror alone can. But nothing is more impressive than HR-Vs cargo capabilities. When you have a lot of cargo to carry or if you need to move something large and awkwardly-shaped, be prepared to be impressed. Unlike most compacts, the fuel tank isn’t tucked under the rear of the car. Like its little bother the Honda Fit, which is built using the same chassis, HR-V’s fuel tank sits directly under the driver and passenger in the first row. That’s an amazing innovation for a couple of reasons. Firstly, in the event of a serious collision, the fuel tank is safely in the very middle of the vehicle’s mass. Secondly, it leaves a cavernous amount of room behind the first row. And THAT is where the real magic happens. This one is pretty simple. 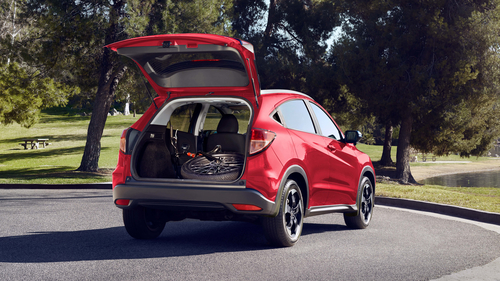 With all seats in their upright position, HR-V can comfortably handle 5 adults. With the rear seats down, you’ll get up to 1,665 litres of cargo space to lay awkwardly-shaped or tall objects flat. 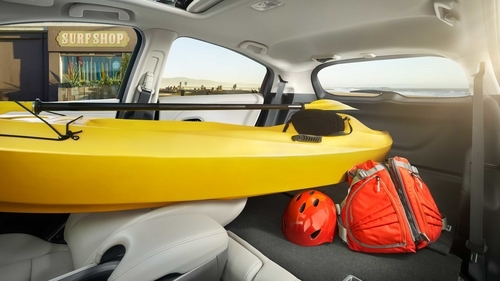 Don’t think the HR-V can handle a kayak? Think again. The front and rear passenger seats fold back to make storing long cargo a snap. Some cargo needs to remain standing up. Beer fridge? Flip up the rear seats to create a taller, more forgiving stowage area. Schedule a test drive and discover why owning an HR-V is like living with a cross between a Golden Retriever and a Unicorn: they’re faithful, fun, ready-to-please and… pure magic.